For malignant tumors to successfully grow and metastasize, cancer cells use an extracellular citrate supplyas an important energy source and substrate for the synthesis of critical cellular building blocks (e.g. fatty acids). Several metabolomic studies indicate that blood citrate levels decrease in cancer pa- tients (e.g. lung, bladder, pancreas). Recent studies show that a significant portion of citrate is taken up by cancer cells from the extracellular space. In contrast, normal cells do not take up citrate except some specialized (liver, kidney, sperm) normal cells. The inventors found a highly specialized plasma membrane protein (pmCiC, plamsamembranecitrate carrier) to be responsible for citrate uptake in cancer cells. PmCiC expression is detetcted in a wide variety of human cancer cell lines, as well as in human tumor tissue sections with differences in ex- pression levels among cancers, and within the different areas of individual cancers (invasion front and invading cells are often more stained that the cells in the central part of the tumor). 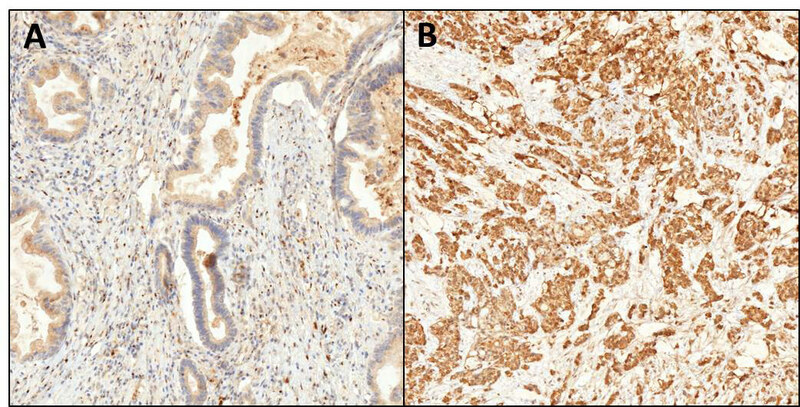 The transporter is also present in normal prostate secretory cells (apically), but works in opposite directions, as citrate ex- porter, and is responsible for maintaining high extracellular citrate levels in the prostate gland. The spe- cialized normal cells (liver, kidney, sperm) that also take up citrate use a different channel (not pmCiC). Small molecule inhibitor which irreversibly blocks pmCiC has been identified and successfully tested in vivo, resulting in decreased angiogenesis and stroma transformation and collapsing of subcutaneous tumor.